Juventus' Portuguese forward Cristiano Ronaldo celebrates his goal during their Supercoppa Italiana final. 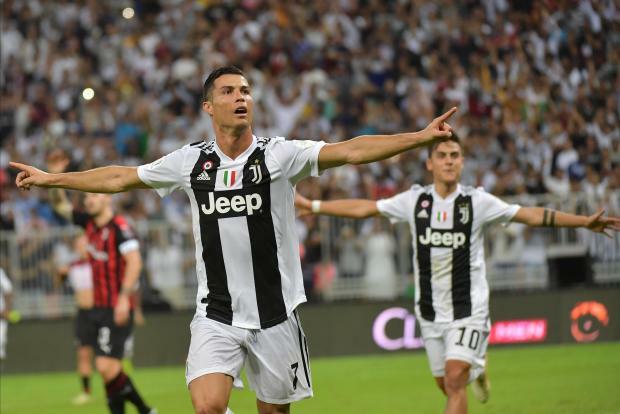 Cristiano Ronaldo scored the only goal to hand Juventus their first trophy of the season with a 1-0 win over ten-man Milan in the Italian Super Cup on Wednesday in Saudi Arabia. Who else but #Cristiano! Ronaldo scored the only goal of #Supercoppa, to win his first trophy with #Juventus. Ronaldo -- signed by the Italian giants last year from Real Madrid as they target a first Champions League title since 1996 -- headed in a 61st-minute winner. Milan played the last quarter of an hour a man down after Ivorian midfielder Franck Kessie saw red for a bad tackle on Emre Can. Juventus have now won the title a record eight times, while Milan have won seven. It was second time that Juventus coach Massimiliano Allegri has lifted the trophy, having lost to Milan in 2016 and Lazio last year.